Growing Potatoes in a Bag! We had some company today, so we’re taking a break from the purge-fest we’ve been having lately. . .after lifting a million heavy boxes and scrubbing tile floors on my knees, my back is nearly done in anyway, so a little well-earned recovery time is in order. But though we’re giving our bodies a bit of a breather today, and really enjoyed our visit with friends, my mind isn’t as interested in sitting still as my body is. . .our unusually warm weather is making me think of spring and compost and deliciously productive gardens. My, how quickly Christmas fades into the past!! Don’t get me wrong. . .I know it’s slightly too early to actually set out our garden (no matter what my psychotic garlic seems to think!! ), but it’s certainly not too late to plan for it! Planning is almost the best part for me, too. . .I get excited just thinking how to best utilize the space I have and dreaming of what new things I’m going to try this year. Last year, I lined two long rows of tubs on the little walkway bridge that leads to my front door. In them, I had garlic and tomatoes and rosemary. All did BRILLIANTLY out there in the little sun-trap that is my front yard. 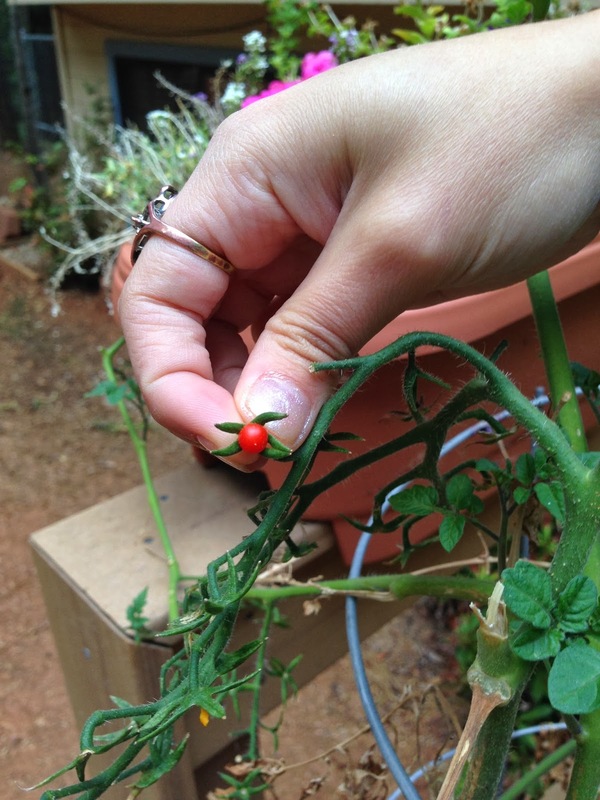 For almost all season, the deer left the tomatoes alone. . .either they just didn’t discover them or the proximity to the front door kept them at bay. Near the end of the season, however, they were stripped clean in one night. Sigh. This year, I’m going to replace our normal hanging baskets of cascading flowers with hanging baskets of tomatoes, which will hopefully be out of reach. We’ll see if that helps. I’ve already purchased some planter boxes that fit on the railings of our back deck to house my herb garden (rosemary can be left out front. . .it never gets bothered). I’ll put them along the edges of the second story deck in a corner that gets a little sun and see how they do. I’m also going to do some make-shift gro-bag gardens, protected by temporary chicken wire, if the permanent protective structures aren’t up. I used gro-bags a lot in England when I had no real place to garden. Essentially, they are just bags of growing medium that you make two little cross cuts in at either end and a couple of drainage holes in the bottom. You can plant whatever you like in them, though I have found things like cucumbers and zucchini and other kinds of squash work best. But I’m most excited about doing some serious vertical potato growing! 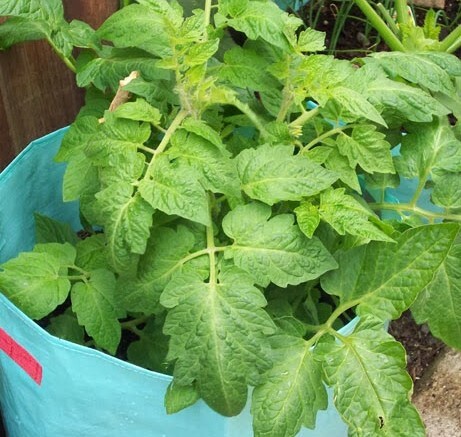 Potatoes can be grown in everything from canvas bags to plastic pots to wine barrels, to purpose built containers, which you continue to build around the potato plant as it grows. 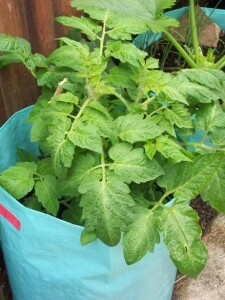 You can also just ‘mound ‘the plants as they grow, or start your potatoes in deep holes, adding soil over time, but it’s certainly easier to keep your soil in place, and to harvest if you use a container of some kind. If you use something that’s pretty deep, you’ll be surprised at how much of a harvest you can get in a very small space. Done right, you can get up to 100 pounds of potatoes out of four square feet (that’s only 2×2!!). Yee-Haw. The basic idea is to plant your seed potatoes (leaving at least 2-3 eyes in each piece) in a well-drained soil low in nitrogen (great foliage, but notsomuch on the tubers!) and high in phosphorus and potassium. Working in a little compost and/or peat moss helps things along nicely. If your soil has a lot of clay, or is very ‘heavy,’ speak to your local nursery about how to best address it. Potatoes like soil they can easily expand into! Don’t use manure, though. . .it causes scab. If you want to be very kind, you can add fertilizer: 5-10-10 or 10-20-20. Make sure your container or bed gets lots of sun, too. Make sure your bed is free of rocks and roots and other debris. . .the fluffier and ‘clearer’ the soil, the more room you potato plants have to grow large, luscious tubers! Lay a layer of soil on the bottom of your chosen container about 12 inches thick. Place your seed potatoes on this layer and cover with an additional 8 inches of soil. Water and wait for your potato plants to sprout. When the plant top reaches 12 inches high, carefully add 4 more inches of soil (never covering up more than 1/3 of the plant), making sure any surface tubers are completely covered. Repeat every time the plant reaches 12 inches and you will encourage more and more tubers to form. You can dig new potatoes 7-8 weeks after planting, being very careful as you scrabble the hills so as to leave most of the roots undisturbed. Harvest your main crop about 2 weeks after the tops have died back. Note: I never wanted to grow potatoes before about 8 years ago. . .I thought that they were cheap to buy anyway, space intensive to grow (I had better things to plant! ), low yielding for the effort and tasted the same as store bought. One year, each of our children were given their own patch in our garden to manage and two chose to grow potatoes. I could NOT believe the flavor difference! A-MA-ZING! Plus, now that I know how easy it is to make one plant grow ‘up’ and produce a LOT, it is well, well worth it! Be the first to comment on "Vertical Potato Growing: Little Space, But a GREAT Return!"